Candidates who are eagerly in search of SBI SO Online Application 2019 are at the correct place. Soon, the State Bank of India will be issued a Recruitment Notification to fill Specialist Officer (SO) Vacancies. Candidates who want to pursue their career in the Banking sector can apply for the SBI Specialist Officer Jobs on or before the last date. Since the online applications are available only for a particular period, you can immediately start the SBI Online Application process. The candidates who are not aware of the SBI SO Recruitment 2019 can check the Advertisement form mentioned below on this page. For further insight into the SBI SO vacancies 2019, you can stay on this page. The State Bank of India is looking for the most eligible contenders to take up the SO posts. It is good news to the candidates who have the dream to do the Bank job. Applicants should check the SBI SO 2019 Notification to check Eligibility Criteria, Application Fee, the Last Date etc. We are providing the detailed step by step procedure of SBI Specialist Officer Registration Steps. You can immediately start applying for the SBI SO Vacancies. For that purpose, the individual must need some important documents and the basic information. The SBI SO Online Application guidelines are clearly explained in the upcoming sections. Name of the Post: Specialist Cadre Posts. 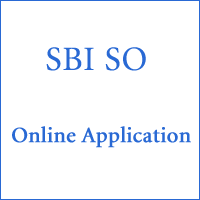 In general, the SO Online application is available at the SBI Home Page. The aspirants who are interested in applying for the SBI SO Recruitment 2019 have to pay the Application Fee through Online mode such as Debit card/ Credit card / Internet Banking. It is the responsibility of the individual to fill sbi.co.in Application without any mistakes. Otherwise, the application will not be valid. The contenders have to submit the application before the completion of the last date. Category wise Fee Details is available below. For General/OBC: Rs. 600/- with intimation charges. For SC/ ST/PWD/XS Categories: Rs. 100/- with intimation charges. The State Bank of India Online Registration Process involves various steps. It is the responsibility of the candidate to duly submit the online application with complete knowledge. The following are the steps involved to complete the process of online application. Candidate Registration: First of all, the candidate should complete their Registration. Upon the completion of the registration, the individual will get user id and password. During Registration candidates should give their personal details like name, father’s name, mother’s name, date of birth etc. to create a user id. Aspirant Educational Details: After Completion of Registration, the candidate can Login with their User Id & Password to complete the Application. Now, the candidates should enter all details in the Student Information form and their educational details. In student information, candidates had to fill the fields like mother tongue, contact details, reservation category (if any), annual income, postal address for the communication etc. And in Education Details, candidates need to fill in all the details related to their Educational Qualification. Photo & Sign Upload: The candidates should upload the scanned images of their Photograph, Signature, and self-declaration. After uploading all the documents, candidates have to tick mark the Declaration tab. With this, your Application form filling and checking process is completed. Now you can submit the Application on clicking on Submit Button. After Completion of Submission Take Printout of SBI SO Online Application for future reference and must remember their user id and password for future logins. Fee Payment: After Submission of Application, you will be redirected to Fee payment page. Applicants can pay the SBI SO Online Application Fee either through Bank Challan or Demand Draft. Candidates should be ready to scan the Copies of the photo, signature, left-hand thumb impression, and father’s/mother’s/Guardian’s signature. Fill the Application with all correct details. Submit the application before the due date.